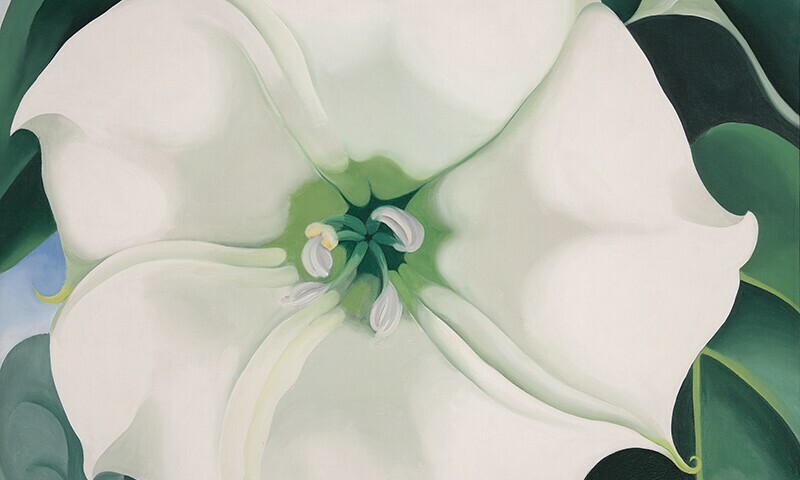 Georgia O'Keeffe, Jimson Weed/White Flower No. 1, 1932, Oil on canvas, 48 × 40 in., Crystal Bridges Museum of American Art, Bentonville, Arkansas, 2014.35 © Georgia O'Keeffe Museum. The Beyond: Georgia O’Keeffe and Contemporary Art is an innovative exhibition that celebrates the work and legacy of Georgia O’Keeffe (1887-1986). The Beyond brings together over three dozen iconic works by the artist, including floral paintings, cityscapes, and desert scenes, as the centerpiece of a unique exploration that highlights her continued force as a touchstone for contemporary art. Drawn from important public and private collections across the country, this exhibition presents paintings and sculpture that span O’Keeffe’s long and prolific career alongside works by twenty emerging artists that evoke and expand upon her artistic language. The NBMAA is proud to be the final and only northeast venue for The Beyond, which is organized by Crystal Bridges Museum of American Art, Bentonville, Arkansas, and to feature seven additional works by O’Keeffe that are exclusive to the NBMAA’s presentation. Recognized as one of the preeminent American painters of the twentieth century, Georgia O’Keeffe pioneered revolutionary ways of visually interpreting the world through her early embrace of abstraction and effusive use of color, and the hallmarks of her work will be seen anew through their continued influence on artists working today. The exhibition will not make one-to-one comparisons between O’Keeffe and the contemporary artists included here. Rather, the work of these artists is intended to expand on conversations and subjects O’Keeffe presented in her work and her life and will be grouped by themes, including Flowers; Cities and Deserts; Still Lifes; The Intangible Thing; Finding the Figure; and The Beyond. Saturday admission from 10 am to noon is free due to support from the American Savings Foundation.